Everything that is REAL was IMAGINED first. While this statement applies to the imaginative play that occurs in our remodeled playroom and kids lounge, it more appropriately describes the vision I thought of in creating this space. With seven children, ages two to sixteen, this room was designed to be a place where the older children could watch movies with friends while also serving as a cheerful place where the young ones could create and explore. I wanted this room to grow with my family yet I wanted it to be a stylish space. I didn’t want a room filled with primary colored tubs that resembled a preschool…I wanted a whimsical space that I could relax in despite that mess and chaos that occurs. Originally, this room was one massive media room but I remodeled 1/3 of it to make a very small guest room and created this enjoyable kids lounge and playroom out of the other 2/3 of the room. I created what I NEEDED and not what this room was purposed for. Although this post describes my playroom sources, you can find the guest bedroom sources on the highlight buttons on my Instagram. After designing the small bedroom and bathroom, I replaced the carpet in the new playroom with vinyl plank flooring in Duxbury Oak from COREtec. I didn’t want the expense of real hardwood for a children’s room and just liked the idea of having waterproof and durable flooring in our kids’ space. 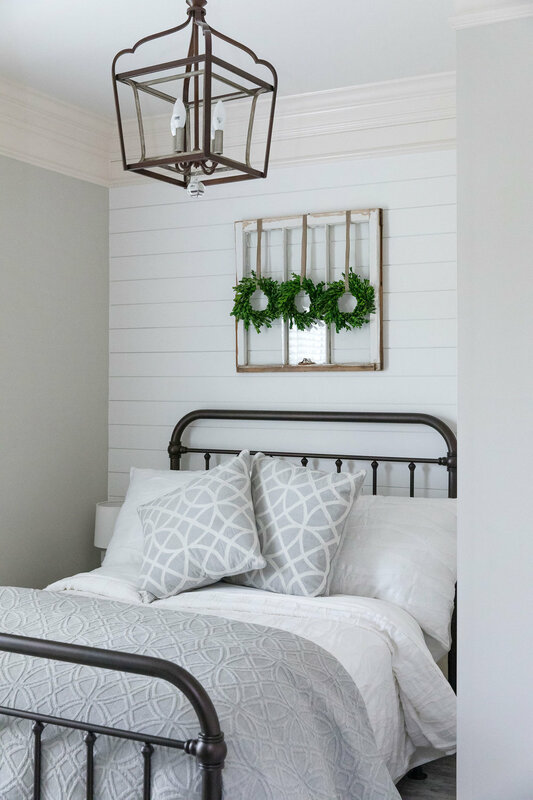 I painted the walls Sherwin Williams Agreeable Gray and added these beautiful curtains from a wholesale dealer I discovered in Atlanta’s market. These panels are a soft white with a pop of embroidered aqua and gray. I loved their look so much that I decided to offer these, and others out of this same collection, to my clients and Instagram friends on a small section of my website. In choosing furniture for the lounge part of the playroom, I selected chesterfield gray couches from local store, Head Springs Depot. If you are not local, you can click here to find a near identical Chesterfield sofa for under $700. I also purchased the white coffee table at Head Springs Depot and for a similar look, this one is a good option. The “statement piece” of this play space is this gorgeous gray and white striped rug with multicolored polka dot detail. While I normally don’t spend more than $300 on a rug, I couldn’t resist this fabulous find. Click here to add this rug to your playroom! My husband and children painted the formerly cedar playhouse Sherwin Williams Alabaster with a complimentary aqua blue for the shutters. This playhouse was made for outdoor use but I loved the idea of turning into to a little garden cottage. We added stick on, battery operated lights to the ceiling for a little extra glow. I always love the idea of handcrafted and homemade elements of décor in my designs. For wall art, I gave my children 10 x 10 canvases and paint IN ONLY THE COLORS I USED IN THE ROOM. My children then painted their favorite animals and self-portraits that are so much more meaningful than anything I could buy in a store. I also framed school art of each child and book pages torn from my favorite stories. The custom unicorn ruffled teepee I purchased from Etsy and the garland was also discovered from a talented seamstress on Etsy. 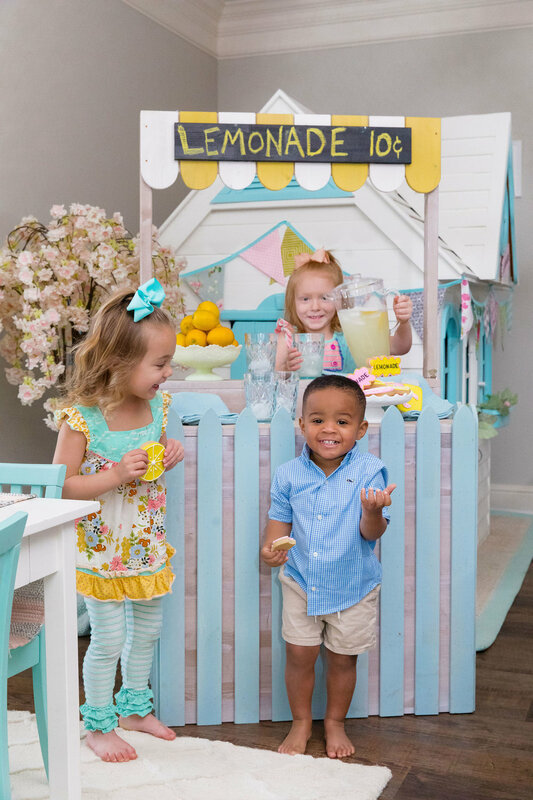 The lemonade stand was a quality find this spring at HomeGoods. As HomeGoods “Style Expert,” I work closely with their PR team who sent me a photo of this when they saw it in New York. Imagine my surprise when I found at my Nashville store two weeks later. For just $129, this collapsable stand has been such a unique and well loved feature in our play space. On the entertainment wall, I added shiplap for a neutral accent. The wall unit is the Cameron system from Pottery Barn that you can custom design to fit your space. I liked the idea of storage cabinets to hide the mess while I used canvas bins to store larger toys on the bottom. Most of the smaller accents, like the bookends, frames and pillows were from HomeGoods. Finally, I had one custom piece of furniture made to house the large collection of American Girl doll horses that my girls had accumulated. They were so tall and awkwardly shaped that no storage solution I had previously thought of properly displayed or stored their herd. 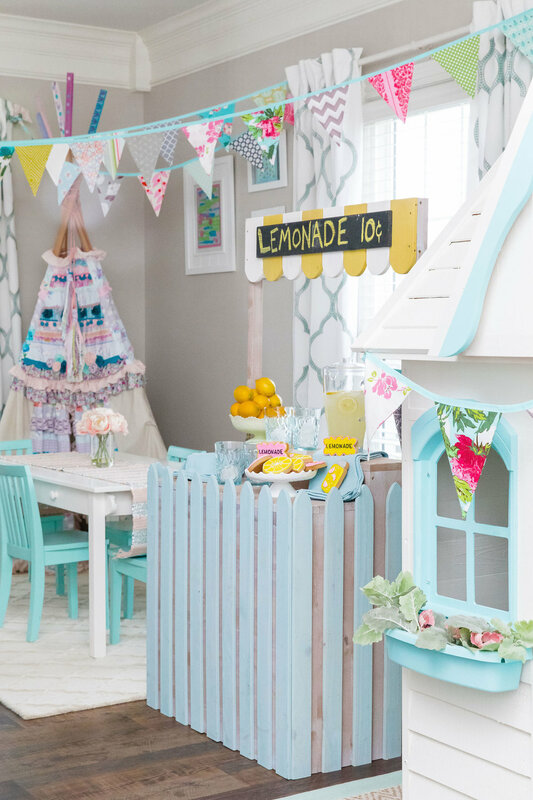 I had a craftsman build a bench with stalls and operable barn doors that now serves as a creative storage solution and an imaginative play zone. The “PLAY” letters were galvanized and I simply spray painted them aqua with a $3 can of aqua spray paint. Combined with my children’s hand painted art, this corner is one of my favorites in the room. If you can’t find it, CREATE it! For the quickest response to questions about this room, DM me on my Instagram @jennyreimold.